Following our Lord in this dark and confusing hour requires that we recognize and hear His voice. It is a distinct voice, unlike any other, and our very survival and spiritual development in this new life depends on our capacity to recognize the true voice of our Shepherd. Notice that it is His voice mentioned here, and not just His words, or what He says. Certainly what our Lord says is essential, but we begin by identifying that it is He who is communicating with us; that it is indeed His voice. Only when we have been given what the Scripture calls “ears to hear“, can we enter into the blessing and provision of what the Master is saying to us. Recognition and familiarity comes with spending time together. Friends who fellowship together on a routine basis are readily able to recognize each others’ voice immediately. The telephone rings, and even before the caller says, “It is _”, we know who it is, merely by their voice. Children, from the earliest stage of life recognize their mother’s voice, perhaps even from within the womb itself. And there are many examples in nature where even the dumbest creatures are able to survive because they recognize the voice of the mother or father calling them to safety. The lesson for us here is that it does take time and exposure to recognize our Lord’s voice. Yet, from that point on, Samuel came to know the voice of his Lord and God, and he ultimately proved faithful in carrying out that which was spoken to him. The Lord could be sure that He had Samuel’s ear whenever revelation and guidance for the people was required. Note the fact that it was only when our Lord spoke her name, did she recognize immediately that it was Him. There was no doubt. Even her grief could not mask the fact of His identity. The question presents itself to us then: Are we able to recognize the voice of our Shepherd when He calls to us in the spirit? Of all the voices in our world, both human and otherwise, calling us to do this or do that, are we able to discern the one voice that is calling us to faithfulness, to service, and to Himself? Are we sure that the inner voice of self-will and the self-life is not compelling us and assuming our attention? I can confess that for myself, I have to be most careful that it is not my own inner voice that is guiding me and informing my reality in the spirit. This matter of discernment is one that grows with time and maturity, as we have suggested. Yet we can also pray most confidently and directly that the Lord will protect us from self-delusion and self-guidance; that we would hear the voice of our Shepherd and Teacher; that it will be His business that we are on, and not our own. Oh Lord, please make this so in your people. The Spirit of truth affirms that God, the Logos, is communicating to us; yet we are instructed to test all spirits, as the deceiver can also communicate (see Eve in the garden). Jesus assured us that the sheep would know and hear His voice. A helpful principle regarding greater revelation from God, is that He doesn’t ever provide it apart from Himself. Only as we venture deeper into His heart and holiness through surrendering faith and obedience, will we start to hear from Him in the ways we all desire and need. Only once we have surrendered our will, will He draw us up into His revelation and plans and purposes. Now there may be many missteps along the way, just as with any child, but ultimately the Shepherd will train us up in the counsel and communication of His will. My own personal experience is that His voice is deep, and still and that you know that it is Him and no other. I wish I could explain it in words but I cannot. Just as with a human being, the voice of our Lord is distinct and recognizable. He speaks directly to the spirit and to the heart of His friends, just as He promised when He left this earth. Recall, that He said that it is better that He goes away. Yes, the original twelve heard and knew His audible, human voice, but we too can hear Him, deep down where spirit meets spirit, at the very center of our being. It is a very intimate thing you see, and He never wastes a word. My friends, expect to hear His voice. We need to hear His voice. It is essential for following Him. When you pray is it you who does most of the talking? Be still. Be silent. After you ask Father a question, expect that He will answer; What father wouldn’t respond accordingly to his beloved child? Now this may take some time. so ask for His patience. But again, expect that He will speak to you. But more importantly, whatever He asks or requires of you, do it immediately. Do it faithfully. “Speak, for Your servant hears”, said the child Samuel. You will know if it is Him, not only by what He says, but by His voice, which is unlike any other. And please do not confuse this with some empty mysticism, or psycho-spiritual experience involving inner voices, urges or impulses. Like every pure and perfect thing, the devil and his world has their counterfeits. God’s Spirit will communicate with our regenerated human spirit, and with time, experience and familiarity, we will come to know that it is Him speaking. As we abide ever deeper in Him, and learn the life of the Vine and the branches, we will begin to know Him and His voice in ways that are wonderful and certain. This will only make sense to those breathed on by the spirit. If you are not, then you will hear many voices, and nothing will be discernible. Confusion will result. You will become one of those religious crazies who go around saying that God told them something that every child of God knows He would never say. “The Lord told me that He wants all of you to send me a million dollars so I can build my castle here on earth”, or something like that. The Lord’s voice instills peace and direction. It settles us, and chastens us at times. It never ever confounds the truth of Scripture, because He inspired every word and thought found there. If the voice directs you in ways or concepts that defy the revealed Word, then it is a false voice and to be rejected immediately. My sense is that, over time, you will know that such voices are false, almost immediately. Jesus promised this. The evil one can do impressions, but children born of the spirit will recognize his vain impersonations. If, for example, it is a voice that promises that you can have the resurrection life of the Lord without His cross, then turn back, for this is not the way of the Lord but the temptation of the evil one. Our Lord’s voice is truth, and power, and love; it is sharp and often cuts deep into the hidden chambers of the heart where idols sit proudly on a stolen throne. It fills us, and sometimes consumes us. There are many places in the Scriptures where mere mortals have been undone by the voice of the Almighty. It is the only voice in the created universe that truly matters. Let us be deaf to all others so that we may hear Him, and recognize Him, and respond with trusting obedience and service. Dear Father, please help us in the spirit to hear You and Your Son and all that You are saying to us. 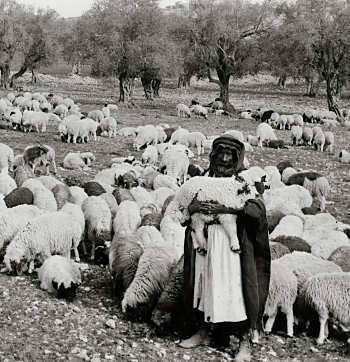 Please give us ears to hear that we might follow our Good Shepherd wherever He leads us, and to prove faithful to His voice in this desperate hour at the end of this age. In Jesus’ name. Amen. Suggested Study: 1) Read the Song of Solomon to see how the Shulamite (bride) and the King (groom) communicate with each other, and how even the sound of each others’ voices fill each of them with longing and love. 2) Read in the Book of Revelation and elsewhere where having “ears to hear” is so vitally important for end-of-the age believers who are making themselves ready for the appearing of the Master for them.